Dr. Savaş Alpay, Director General of the SESRIC, paid a courtesy visit to H.E. Dr. H. Susilo Bambang Yudhoyono, President of the Republic of Indonesia, on 14 March 2012, in Jakarta. Mr. Sudi Silalahi, State Secretary, Mr. Suryadharma Ali, Minister of Religious Affairs and Dr. Dipo Alam, Cabinet Secretary, were also present at the meeting. H.E. Dr. Yudhoyono welcomed back Dr. Savaş Alpay to Indonesia since his last visit when he attended the 7th Session of the Parliamentary Union of OIC Member States (PUIC) Conference held in Palembang in January 2012. His Excellency mentioned that he follows SESRIC’s outstanding work in all fields and appreciates the efforts of SESRIC towards enhancing mutual cooperation among the OIC member countries. During the courtesy visit, Dr. Savaş Alpay delivered his thanks to H.E. the President of Indonesia for his support to the SESRIC and he briefed H.E. Dr. Yudhoyono on recent initiatives of the Centre on enhancing technical cooperation activities among OIC Member Countries along with recent programmes on how to improve the positions of the Member Countries in different sectors globally. Dr. Alpay emphasized the importance of technical cooperation as well as scientific research reports based on sound statistics in the context of evidence-based decision making. He also mentioned SESRIC’s willingness on increasing the cooperation with Indonesia in every field and the readiness for project proposals to be received from Indonesia. Dr. Alpay continued his briefing with a number of important comparisons of the performance of OIC Member Countries in critical areas such as Research and Development and Innovation, with respect to developed and developing countries. H.E. Dr. Yudhoyono expressed his high appreciation for such important research activities of the SESRIC and supported the idea of Dr. Alpay that scientific and technological investments in OIC Member Countries should be promoted highly and in a timely manner. H.E. Dr. Yudhoyono, on his side, thanked Dr. Alpay for sharing the outstanding and future-oriented ideas, and he ensured Dr. Alpay with their full support on SESRIC’s activities. His Excellency also emphasized the importance of economic cooperation and development for OIC Member Countries, and stated that OIC Member Countries are part of the global economic system, and should be contributing to the global economy in a more meaningful manner. Dr. Savaş Alpay expressed his sincere thanks to H.E. Dr. Yudhoyono for his warm hospitality, and invited His Excellency to the Opening Ceremony of the new headquarters of SESRIC, which will bring together the leaders of many OIC Member Countries this year. Dr. Alpay also thanked H.E. 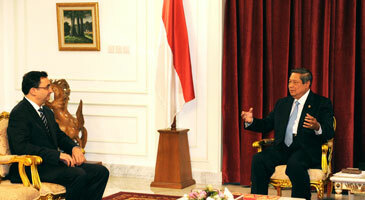 Yudhoyono for his interview to be published in the next issue of Economic Cooperation and Development Review.